El Profesor Carlos Gervasoni ha pulblicado el capítulo “Argentina’s Declining Party System: Fragmentation, Denationalization, Factionalization, Personalization and increasing Fluidity” en el nuevo libro editado por Scott Mainwaring, Party Systems in Latin America: Institutionalization, Decay, and Collapse (Cambridge University Press, 2018). Abstract: Argentina’s party system deinstitutionalized significantly since the mid-1990s, a process characterized by five interrelated trends: 1) fragmentation, 2) denationalization, 3) factionalization, 4) personalization, and 5) increasing fluidity. The common theme behind these tendencies is a transition from a relatively simple and stable party system to one that is very complex and volatile. The 2015 victory of Mauricio Macri’s Cambiemos alliance –headed by PRO, a very young and denationalized party– epitomizes this process of deinstitutionalization. Argentina, however, has stayed clear of party system collapse: its two main historical parties –the PJ and the UCR– are still significant players. 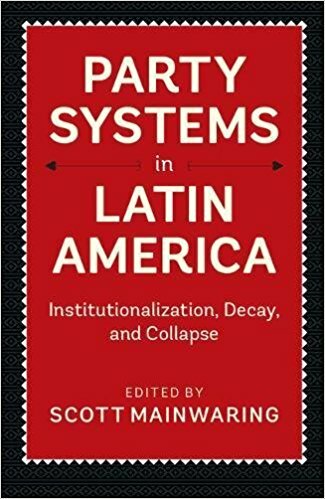 The chapter provides a description of the main parties, an analysis of recent changes in the party system, an assessment of its current level of institutionalization and, finally, a set of causal explanations for recent deinstitutionalization trends. The extreme permissiveness of electoral and party rules, federalism and decentralization, the programmatic inconsistency of most parties, the 2001-2 political and economic crisis, and the political strategies of presidents Néstor and Cristina Kirchner, have all contributed some to the current state of affairs. The declining level of party system institutionalization has hurt democracy in terms of two important dimensions: electoral accountability and institutional checks and balances.